You are here: Home » Burning question: Marquette’s leading scorer? Burning question: Marquette’s leading scorer? For the next five weeks, Paint Touches will ask five burning questions leading up to Marquette Madness. This week asks who will lead Marquette in scoring. Mark Strotman: Perhaps the most intriguing question this year for Marquette is who will lead the team in scoring. Paint Touches has well documented that departed seniors Jae Crowder and Darius Johnson-Odom accounted for more than 47 percent of the team’s scoring and 44.5 percent of its field goal attempts, so there’s plenty of scoring to go around in 2012-13.Trent Lockett is the leading “returning” scorer, averaging 13.0 minutes in 34.9 minutes per game for Arizona State. 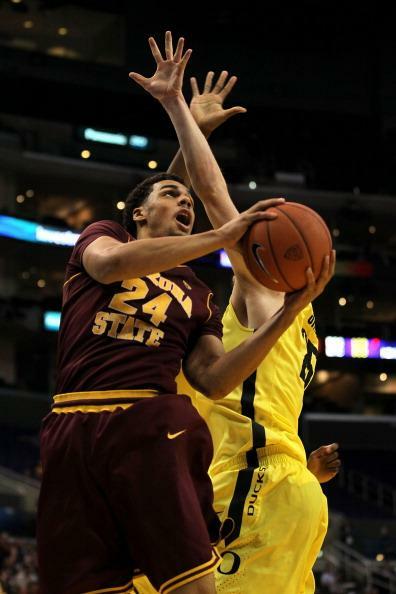 The Devils played one of the slowest offenses in the country last year, and the now-senior Lockett was efficient (54.7 effective field goal percentage) in getting to the basket and choosing open perimeter shots. The graduate student didn’t come to Marquette to sit, and while the wing position is crowded, Lockett heads that group. The biggest question mark is how Lockett fits into Marquette’s up-tempo style of play. The 6-foot-4 shooting guard plays a similar style to that of Jimmy Butler, and while he’s two inches shorter than Butler, both hit the glass hard, get to the basket and are efficient in limited shots from outside. Butler was 36-of-90 (40 percent) from 3 his last two years; Lockett was 21-of-51, 41.2 percent his junior year. Marquette’s scoring will be spread out this season, but Lockett has the size, versatility and minute-potential to lead the team in points per game this year. Andrei Greska: Don’t get me wrong, Locket’s addition is huge for the offense after the loss of two NBA talents, but the Minnesotan will have a hard time taking the crown. It has nothing to do with Lockett’s skill or experience, but rather the sheer number of legitimate scorers in the back court. Vander Blue has made headway each season, and will continue yet again. Todd Mayo was born to put the biscuit in the basket, and should he avoid the midseason slump that plagued him last year, will be tough to take off the court. Then there’s Junior Cadougan, who may have been a pass-oriented point guard before but will be much more aggressive attacking the basket this year. I don’t expect all four players to go off for 15 points every night. That means the scoring will be too spread out for Lockett to get the amount of shots he would need to lead this team in scoring. Come November 9th, Davante Gardner will hear his number called over and over in offensive sets. Using John Pudner’s Value Add metric, Gardner is Marquette’s best returning offensive player (and best overall). Stats don’t lie. When Gardner gets a feed in any sort of position under the basket, he either scores or is fouled. Should he remain healthy for most of the year, Gardner will be the Golden Eagle’s offensive focal point and leading scorer in 2012. MS: There’s no question Gardner is perhaps Marquette’s best scorer, and he’s easily the team’s most efficient scorer, but take a look at Marquette’s leading scorers the past four seasons and how many minutes per game he averaged: Darius Johnson-Odom (32.9 minutes); Johnson-Odom (30.0); Lazar Hayward (32.3); Jerel McNeal (35.0). The fact is, regardless of how deep Marquette’s bench is, the leading scorer is going to play, at least, near 30 minutes a night. Whether it’s because of his conditioning, his the return of Chris Otule, I can’t see Gardner averaging enough minutes to lead the team in scoring. But a player who should reach that minute total is Vander Blue. In order for Marquette to overcome the loss of Jae Crowder and Johnson-Odom, someone will need to step up. That player easily could be Blue, who has the athleticism, speed and knowledge to be the go-to player in Williams’ offense. It’s easier said than done, but he just needs to put it all together. He’s right there, and if he truly has dedicated himself this summer, that means an improved jumper and more body control at the basket. If those two deficiencies are fixed, Blue will lead the Golden Eagles in scoring. Todd Mayo returning mean’s fewer shots for Blue, but T.J. Taylor is no longer in the mix, meaning Blue is the back-up option at the point as well (with Derrick Wilson more of a situational player). Both the minutes and shot attempts will be there for Blue. What he does is up to him. AG: The biggest quibble I have with looking at the minutes played by previous scoring leaders is it takes away so much of the context. For McNeal’s season (2008-2009), a shallow bench led to major back court minutes. Of course he played seven-eighths of every game. 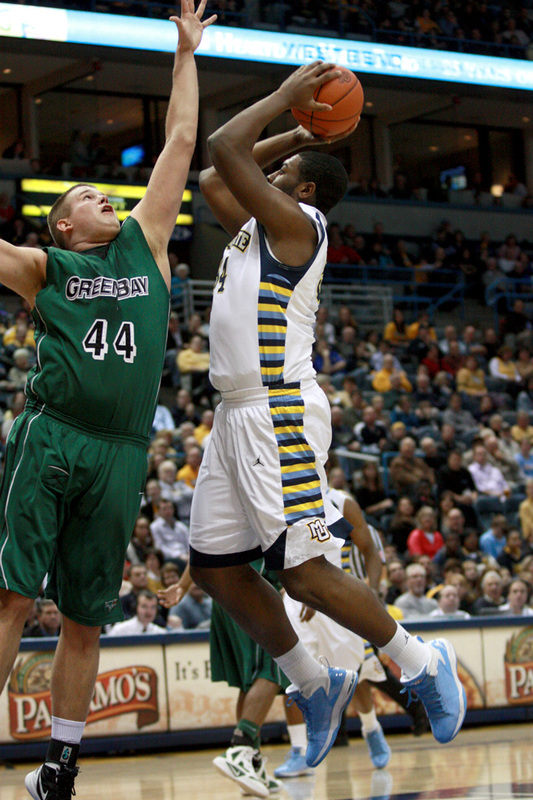 For Hayward (2009-2010), he was playing the five at times because Marquette lacked size and front court depth. For 2010-2011, Johnson-Odom and Butler were the go-to scorers with Butler carrying the heaviest load of minutes (34.6). Last season, for the first time in Buzz’s tenure there was a semblance of depth. Still, Johnson-Odom and Crowder were the clear offensive leaders. What all of these players had in common is they had the ball in their hands early and often. It wasn’t so much a matter of minutes played, rather ample license to shoot and score as clear offensive leaders. There is no clear offensive leader in the back court this season. Had Lockett played here the past three years then he would take the mantle. Your argument for Vander still relies too much on one phrase, “If those two deficiencies [improved jumper, body control at the basket] are fixed.” That’s a huge “if” that is much easier talked about than executed. Adding Mayo and a more offensive-minded Cadougan muddies up the water too much for any one of them to get the high scoring average needed to best Gardner. So you are right when you say Gardner won’t get 30 minutes—especially adding Otule into the mix—but unlike most years, 14-15 points may be all that is needed to head the scoring department. MS: You may have me sold on the back court being crowded, but if that means someone from the front court is going to lead the team in scoring, Jamil Wilson would be my pick. When Chris Otule’s season ended at Madison Square Garden last December, no player was affected more than the Oregon transfer. The team’s most versatile player, Wilson was relegated to the Lazar Hayward-type “center” position, which affected him more on the defensive end, but still he couldn’t spread his wings as much offensively. Wilson has said he’s more comfortable on the perimeter, and with Otule, Gardner and Steve Taylor inside, Wilson will have a bit more freedom to shoot from outside this year. That, and he could wind up being Marquette’s best player. The fourth-year junior is tough inside (despite his below average rebounding numbers), can run the floor with Marquette’s speedy back court and can put the ball on the floor surprisingly well (he rarely had to last season, given his role). Someone needs to step up to make up for Crowder and Johnson-Odom’s scoring output, and it could very well be the same person who becomes the team’s leader this year. Wilson may have the highest ceiling of anyone on the team, and if he develops a killer instinct in 2012, he’ll be at the top of the scoring list. Either way, he’s an impact player and a matchup nightmare as a switchable. AG: I am as big a fan of Wilson’s game as there is, but I think he still needs another year to truly be the guy in Williams’ offense. His length makes him the a threat to score from any spot on the floor — his turn-around fade-away is much improved, although he doesn’t hit at a high enough clip yet to fully stock it in the arsenal. As you said, he has a decent handle when needed and even more impressively, can finish with either hand at the rim. However, Wilson still doesn’t have, or at least hasn’t shown, the aggressiveness needed to lead the team in scoring. He seems passive on offense and isn’t taking the last shot with the game on the line. You know who is — and who already has, for that matter — Todd Mayo. His late floater in the Kohl Center with under a minute to go last year was something special from a freshman. You can’t teach that killer instinct. That is what made so many Marquette fans believe they had something in Mayo, and what ultimately led to a lot of disillusionment when his 3-point shot disappeared during the Big East season — he went 2-of-19 from long distance in the final 11 conference games. On a more positive note, Mayo was rounding into form as the season ended, scoring 29 points in the NCAA Tournament. As pointed out earlier, he is fearless. So while I have my reservations about picking a leading scorer from the guard spots, Todd has the best chance of them all to get the title.